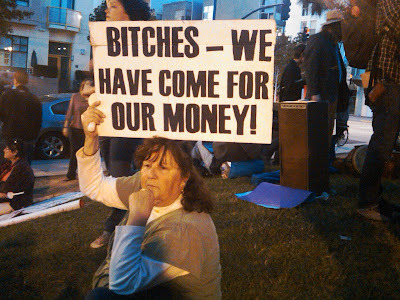 Occupy San Diego; Photo Credit: Me! (NYP) (M) It’s political dis-scent: An olfactory artist has transported the stench of Occupy Wall Street from Zuccotti Park to a Staten Island art gallery. “The Smell of a Critical Moment,” which opened yesterday at Doorways on Van Duzer Street, features 99 T-shirts that protesters wore for a week straight, without washing them. Artist Gayil Nalls distributed new white tees to OWSers and on Jan. 12 collected the body-odor-drenched shirts to capture the revolution’s essence. The park’s putrid smell became a major health concern before police raided the encampment in November. Many in the Tea Party and libertarian right rightly applauded OWSers for their stand against crony capitalism. It's sad, if not predictable to see #OccupyWallStreet degenerate as it did. Coming up as Occupy "art": Crusty condoms, bloody, disease-riddled used needles and soiled toilet paper exhibited as art? On display next week at Van Duzer Street: "The Smell of a Critical Bowel Movement." Related: At LCR, "(PHOTOS), Occupy San Diego, October 7, 2011"
Updated: The "Smell of a Critical Bowel Movement" even has its own Facebook page. This is a desperate attempt to prolong a movement that fizzled weeks ago. It's sad that the occupy message, which could have been channeled for the good, has been twisted into a complaining platform for people who lack real ideas for solutions. Once a supporter, no longer. Actually, Anonymous, its far more sinister! A Wanna-Be 1%er is exploiting OWS by capitalizing on the folly of the 99% (actually its about, 23%). by handing out T-Shirts to the crowd and the artist is now stealing the value of the labor from those occupiers who worked so damn hard to soil and stink up the shirts for a week. What value will the occupiers get for their "labor?" NOTHING!!! Occupy the Bourgeois Art Gallery Now! If the t-shirts are worth more than when they were clean, would that be considered "sweat equity"? NO matte how you spin it, a skunk, or sweaty T-shirt, will still stink just as badly.